The way that Black culture has evolved since the inception of Hip Hop has been at a lightning fast pace and no 5 or 10 year period has been the same as much has people have done their best to hold onto the good moments and try to relive them in today’s world where the boom bap has been replaced by the electronic and the bounce has elevated to a ‘turnt up’ mentality. There are many layers that engulf the onion that is Hip Hop, and one of those facets that isn’t included in the Holy Trinity (break dancing, graffiti, & rap) is the art of the motion picture. Hip Hop has done its part in showing off the culture for people on the outside to see, as much as television has done its fair share since the days of Yo! MTV Raps, and the golden years of BET with Rapcity & 106 & Park. Movies like Do The Right Thing, Juice, Boyz N Tha Hood, and countless others, have made their marks on displaying the lifestyles of not only African-Americans, but also revealing a lot of Black culture that has been glorified by so many people who know nothing about what’s been going on in the communities they wouldn’t dare venture. Now being that we’re in the era of the Millennals, there really haven’t been a slew of movies to depict the culture, besides Dear White People, which highlighted more so the race relations of Blacks to Whites and other Blacks on a university campus, which is a current and ongoing struggle in itself. 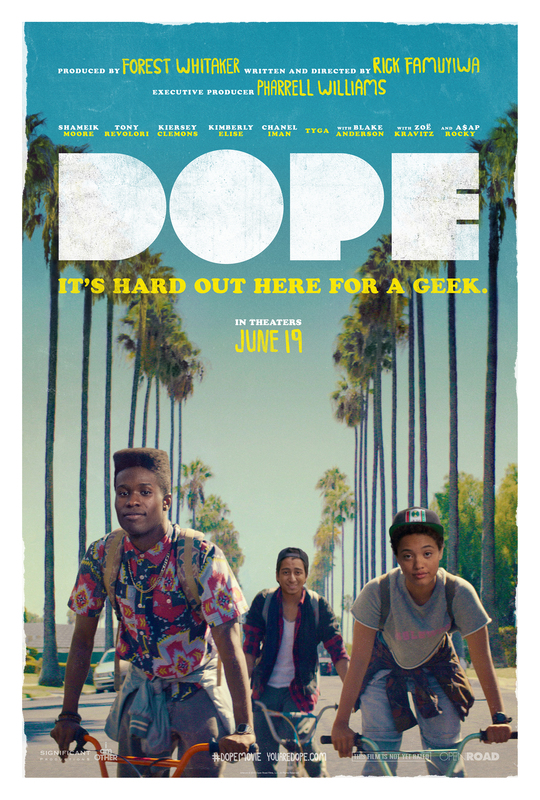 With Dope, the presentation of it serves as a double entendre. The first meaning being the phrase in which we say to highlight satisfaction – to applaud something in a positive manner. The 2nd highlights the pseudonym of various drugs. It’s more so used for Cocaine (or crack), but either way it can be used for a lot of different drugs. It’s just a general term. Now, when you combine the two, you have a little glimpse as to what the movie should revolve around. The language has been established, and the connection is immediate. But like rap music, there are always hidden messages within the words, and the same holds true in this movie as it focuses on the group of friends (Malcolm, Diggy, and Jib) who are nerds in love with 90s culture (likely born in the mid-90s) and are university bound students who are products of The Bottoms located in Inglewood, California – notoriously rough environment. Right off the bat, I can relate to some degree, being the nerd, but also trying to make it out of the hood to do better for themselves than what the surrounding area would suggest. One thing that people seem to get confused about African-Americans, or Black people in general is that we’re limited in terms of our personalities. Not all of us are athletes, not all of us are drug dealers/abusers, and the common narrative that keeps being spun is that we’re criminals right at birth, based on everything being portrayed in the media. What I like about this movie is that you step inside of the mind of a young Black man (Malcolm) who is going through a type of identity recognition crisis and is asked just who he is.